Our best seller! Deservedly the most popular and most widely planted plum in Britain. Delicious eaten fresh off the tree, it also cooks well. Reliable and very heavy cropping. 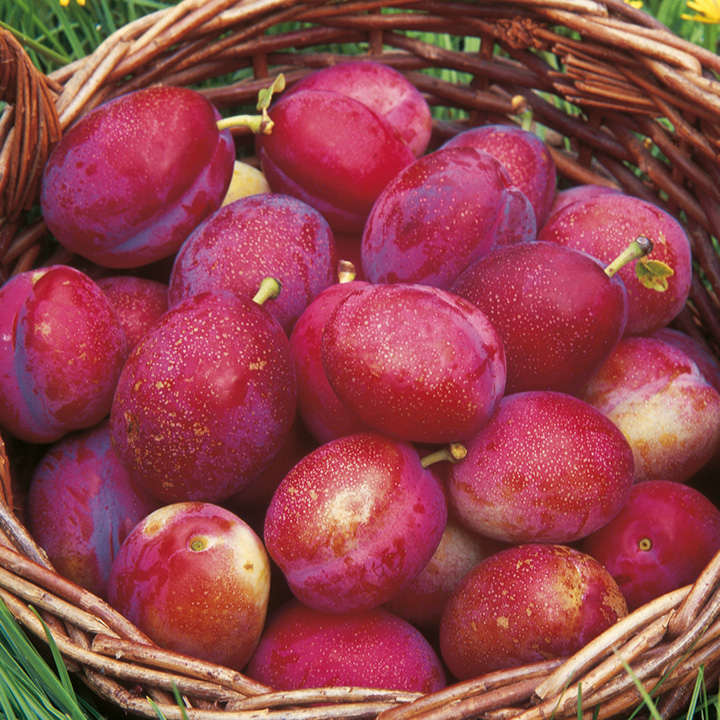 The plum is a very easy fruit to grow in the garden and is capable of yielding huge crops. Plums can be grown as a bush tree yet most modern crops are produced by cultivation in the central leader style. Once the main framework of the tree is established little extra pruning is required beyond removal of damaged or badly placed wood. Pruning is best done in early summer to reduce the risk of silver leaf infection, preferably painting pruning cuts with a sealing compound. In the bottom place a 23cm (9") of tightly packed broken bricks or rubble. Refill with soil adding well rotted manure or garden compost and a little bonemeal. In a pit plant 23cm (9") away from the base of the wall. In both pots and a pit they should be planted firmly.